Peter’s wife, Carol, has informed me that Peter passed away this month. It is with great sadness that I inform you of this news. Peter’s career was with the department of agriculture. He was able to give advice on weeds in particular when putting together an inventory of flora in Minim Cove Park. Peter was happy to take plant specimens to the WA Herbarium to be identified. I remember the first time he went to his mates at the WA herbarium with a grass. He came back with the name "Austrostipa flavescens" and details of how it was identified from other Austrostipas. 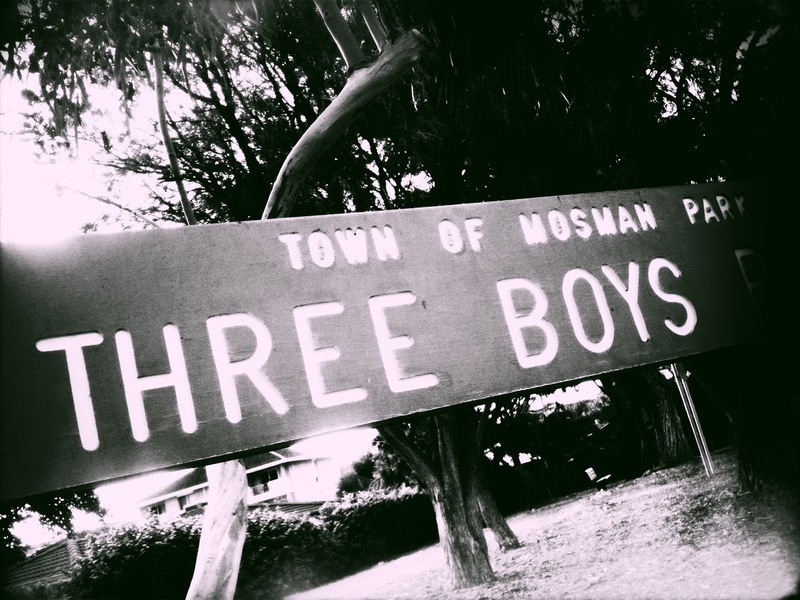 It was with great joy to put a name to this native grass, as it was not present or at a stage where it could not be identified when a professional team surveyed the area for Mosman Park Council. We have since discovered this grass is very hardy, grows tall to shade the earth and reduces wind without robbing other young native plants an opportunity to survive. It only takes what it needs and can live in harmony with it’s surrounding flora. It was great to share the excitement of new plant identifications with Peter as with others in the group. 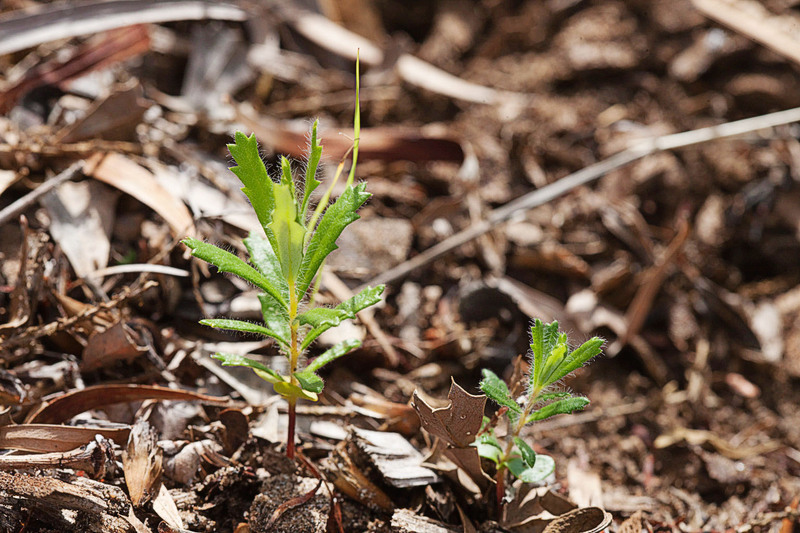 It is one of the joys of bush regeneration to discover new plants and precious young ones coming up. 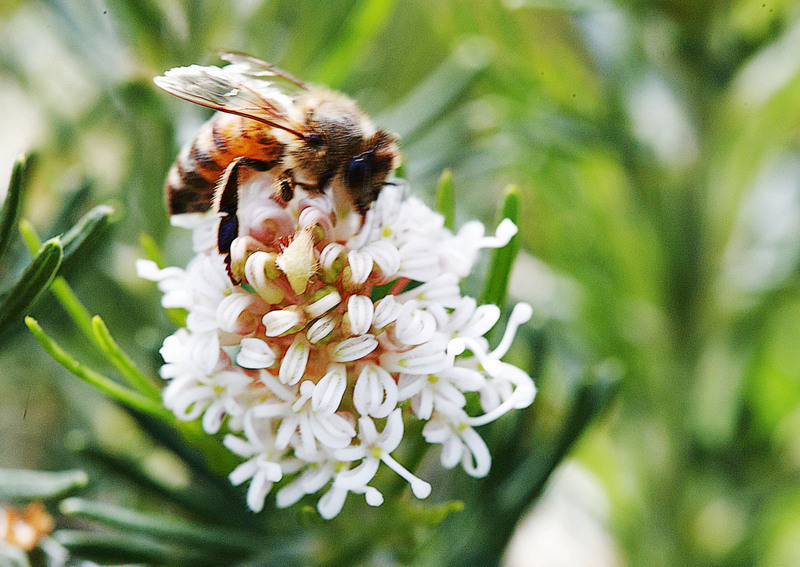 Biodiversity is the lifeblood of bushland, providing food and shelter all year round for those that inhabit it. The commitment Peter put into our newly forming group was heroic considering arthritis limited his mobility. There were many jobs he could do without getting up and down. 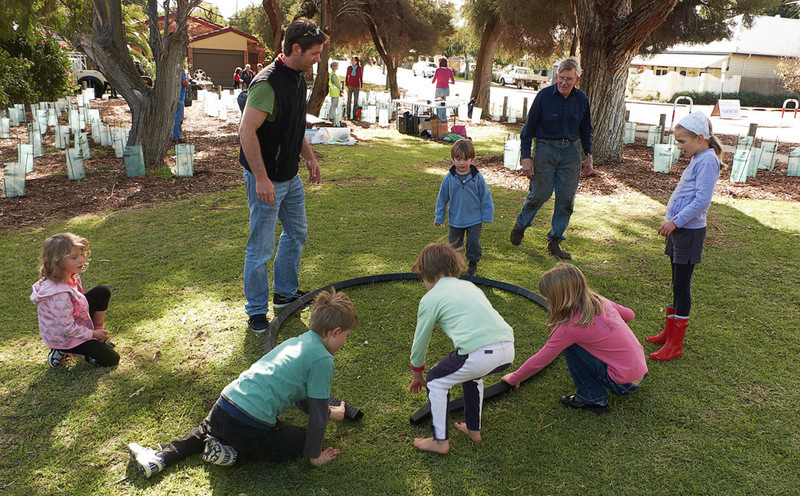 APACE nursery in Fremantle came to Minim Cove Park the first summer we started working in the bushland to show us how to collect seeds. Peter set to work collecting the orange berries from the dysentery bush (Alyxia buxifolia), which he could easily reach because of his height. Little did we know that they are very difficult to grow from seed and all the seed we collected bore one plant that we planted this year along the bush trail. Even though Peter was not agile and had difficulty bending, it did not stop his enthusiasm to put in some long hours getting our bushland jobs done. He would even lend a hand when he was sick working away as long as any of us. An ankle replacement early in the year put a end to his bushland work. We'll have to find that dysentery bush seedling and tender it in his memory. 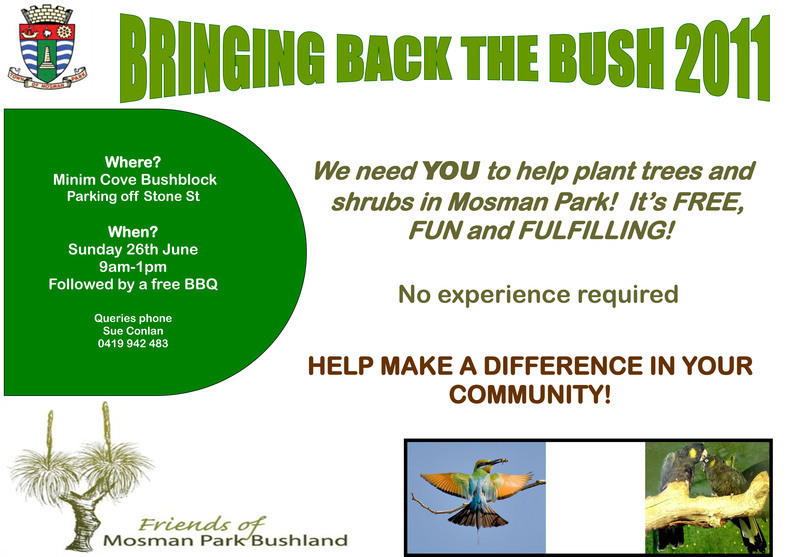 There are only a couple of bushes left in Mosman Park. They are very attractive and have been used as a cure for dysentery. We owe Peter this at least! In the last month we have spent many hours weeding with an enormous amount removed from around last year's plantings and direct seeding plants in preparation for herbicide use inbetween plants. The weeds are looking slightly more manageable but still a lot to be done. Most weeds now have seed heads which have to be removed. Rob has taken some great shots of weeds at last month's busy bee and has them on our website. Take a look here and with a bit more guidance on site it doesn't take too long to pick them out. If you are more comfortable picking on a weed you know well then start with it. Target weeds in good areas and weeds that are competing with natives for moisture and light. Weeding we can get done now will save so much work for us next year. Busy bee starts at 9am! Tools and morning tea provided! Bring a hat, water and sturdy shoes. Entertainment provided by bobtails! About 20 people turned up on what promised to be a bit of a rainy day. It turned out nicely though, light winds and enough sunshine peeking through the cloud to keep us all well and truly warm. The weeds are going ballistic, not surprising given the rain and relatively warm conditions we've had this winter. The weeding team went pretty ballistic too! Bucket loads (literally) of weeds were pulled. We remove all the black flag and soursob from the site as they both have subsurface corms from which they propagate. Other weeds are pulled and left onsite as mulch. 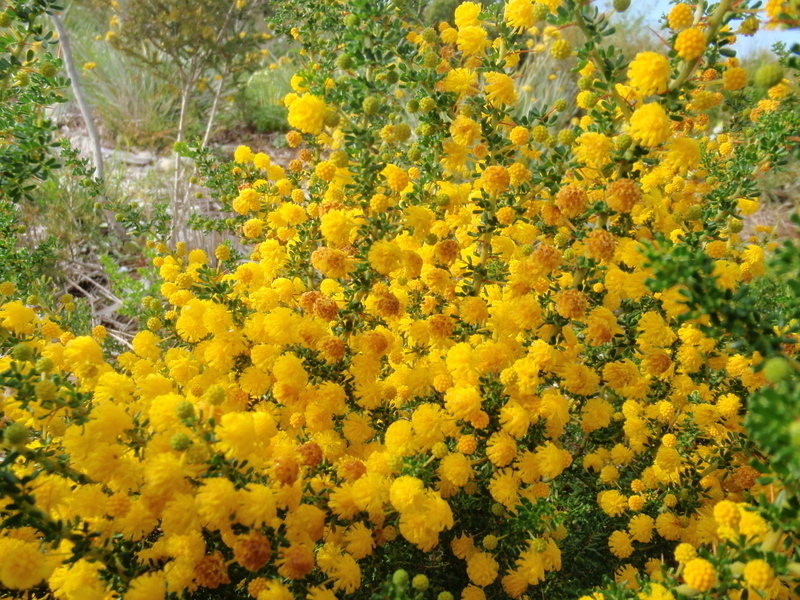 The silver lining to the cloud of weeds was the discovery of self seeded parrot bush, berry saltbush and dianella. The parrot bush was particularly exciting as APACE had had no luck propagating these at their nursery. We are desperate for weeders this Sunday August 28th. No experience required! Anything you can contribute would be very welcome. Weeds are at a critical stage of removal. Any later and they will have formed flowers and seeds. Their profusion this year indicates we were too late last year. We have finished the planting for the year. We thought we had finished a month ago when it was noticed that many parrot bush seeds had germinated in the mulch under the two remaining healthy parrot bushes. Unfortunately they all came up beside each other and would not have survived. This has been a great nursery for us. APACE nursery couldn't get the seeds we collected to grow but here they are coming up in profusion. We have transplanted about 100 of them to areas where there are none and we can water them over the first summer. Our plantings this year seem to be settling in well, Laurel has single handedly been to each one firming up stakes. The last few Fridays we have been working along the path. It has been encouraging to hear people saying how nice it is to walk through that area. We hear this every week from many different people. The shrubs have been flowering for weeks and the birds are a delight to watch. Please come and join in if you feel like some lighter recreation than the city to surf offers. We'll be there from 9am. Our plantings along the bush trail are settling in! Laurel has been tightening the protective sleeves while Ruth, Jim, Sue, David and Frances have planted another 130 seedlings. The weeds have taken off with the wet, mild conditions. Some direct seeding has been spotted! The dwark sheoaks have a tiny brilliant red flower, Acacia lasiocarpa and Acacia pulchella, the small wattles are glowing golden! 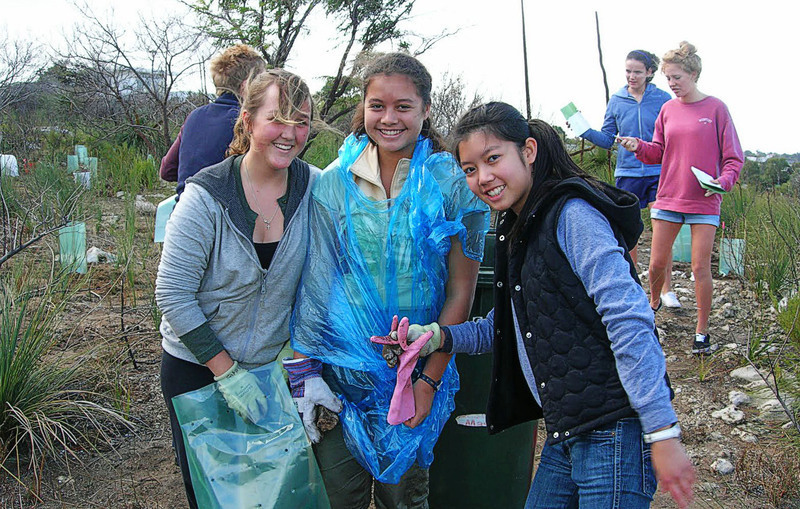 Join community volunteers this Sunday 31st July for some much needed weeding and some planting in the bushland. See our prickly plantings from 2009 in spectacular flower! Mayor Ron Norris will join us for morning tea at 10.30am to update us on what's happening in our suburb, what's shaping our budget, how we are becoming environmentally and socially sustainable. Where: Minim Cove Park, lower gate at the end of Fairbairn street. Time: From 9am to 12noon. What to bring: Water bottle, hat, hopefully a rain jacket. Morning tea and tools supplied! 1000 plants in along the interpretive bush trail in Minim Cove Park! 300 plants in Three Boys Park on Monument street! What teams! It just goes to show what we can do! Everyone has come away from the planting days with a really good feeling that we can make a difference! Together we can make a big difference! There are still plants left over which will go in the bare pockets around the bike / pedestrian path down from the BBQ at Minim Cove. 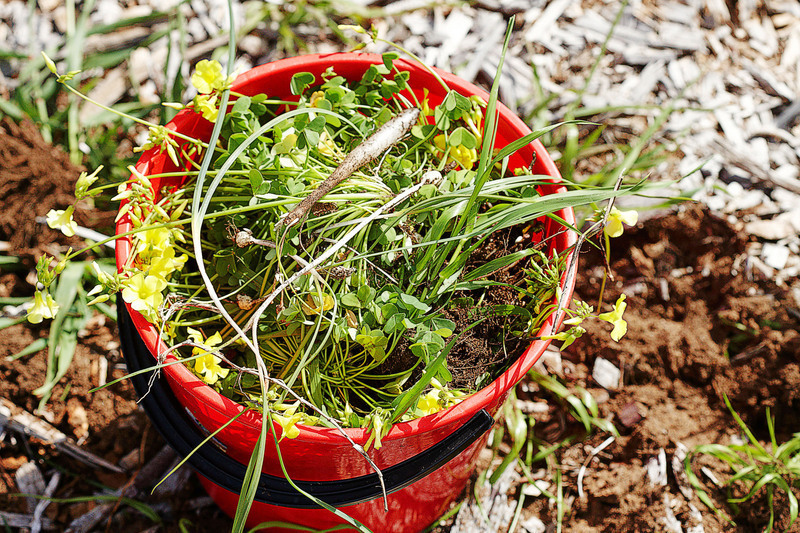 Heidi, the Town of Mosman Park bushcare officer has convinced our council depot that those areas should be sprayed for weeds as a matter of urgency. Planting will resume on Friday busy bees if anyone can get down there from 9am, starting on Friday 8th July. The sooner the remaining plants are in the ground the better their chance of survival. It is very hard to recreate bush. It is so much easier to look after what bush we have left. There are many species of plants in our bushland that are represented by only one remaining plant or just a few. One of these is the only species left in the greater Perth region. 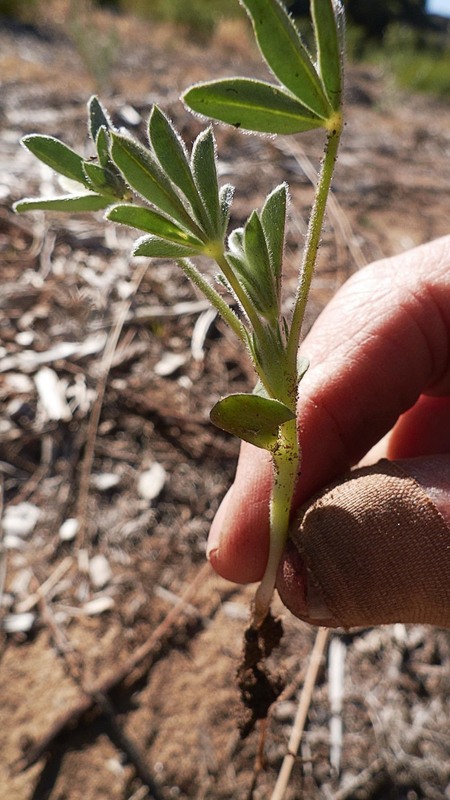 This plant is very difficult to collect seeds from and propagate by cutting. Both seed and cutting propagation has failed for us. 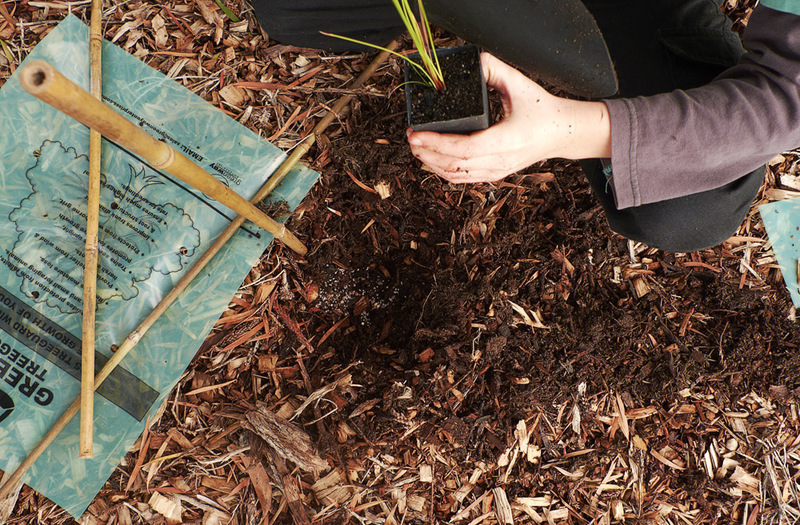 Half of the seedlings on the community planting days came from seeds we had collected from the existing bushland and the other half are species that had been lost to Mosman Park. Kids are endlessly inventive (above) after planting all the seedlings they found a new use for the collected punnets; make a big hoop! Ruth, Laurel and Sue weeded around the bbq today so we can plant into this area next week. 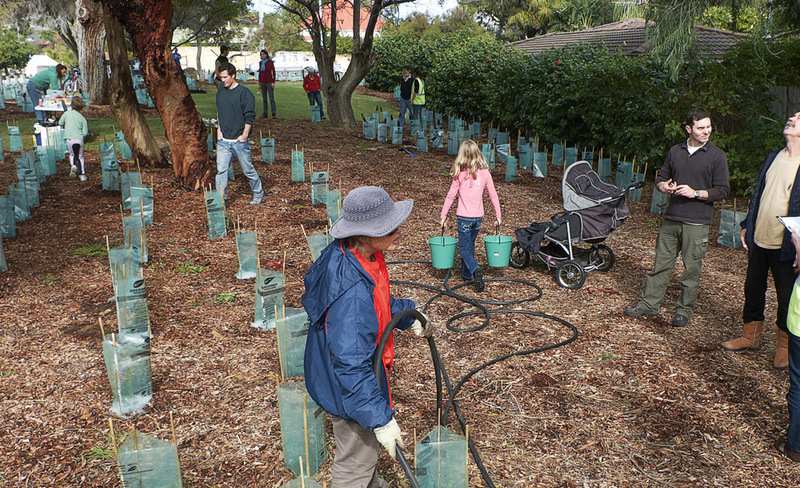 Mosman Park’s “Bringing Back the Bush” Community Planting Day took place on the beautiful morning of Sunday 26th June. A downpour two days before and another two days after was a perfect start to bringing back the bush. Despite a forecast promising showers and some threatening clouds it stayed dry for the planting. Young and old converged on to the site to plant along our future bush trail, It was so lovely to see people of all ages working beside each other to make a difference. Our mission was to plant 1000 seedlings grown by APACE from locally collected seed including some plant species that had been lost to to the area. What an extraordinary sight - a wall of 30 planters worked their way across the ground, moving from one hole to the next, each planter in silent encouragement with the next. Passers-by even joined in! The mayor, three councillors, our young citizen of the year and our environmental volunteer of the year didn’t let up until our mission was completed. The 1000 plants were in and watered just as our bbq lunch was served. Local primary school children coloured our day with paintings of our bush and the creatures that hide in it. Our day of hard work is the beginning of a legacy to these children of bushland filled with a diversity of life. There are many beautiful plants in the fenced area at Minim Cove that we cant grow from seed or cuttings. They do pop up in our bush area from time to time whether it is because of the right soil microbes or because it has been through an animal's intestine first. Bobtail scats are full of seeds. By planting along the bush trail, we are increasing the size of the bushland area, increasing the species diversity for wildlife to come to, bobtail lizards, king skinks, geckos, insects, ants, spiders, snakes, honey eaters, hawks, cockatoos. 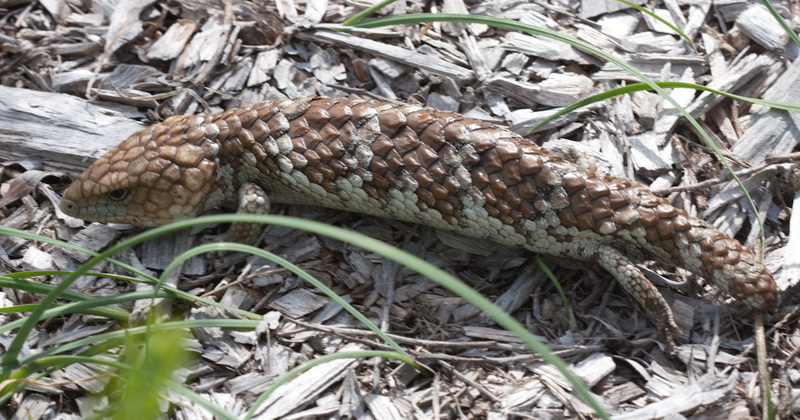 Bobtail lizards now come down to the Cyclops wattle to eat the seed. The further they venture the more our plant diversity will increase. The same with the birds. These animals will eventually help recreate the bush. The Black cockatoos have been flying in after their return from nesting in the wheat belt. We only have 3 mature parrot bush left for them. Hardly enough for a flock of 60 cockatoos. They remember their food trees. One day there may be enough of these bushes regenerated to keep the cockies calling in.